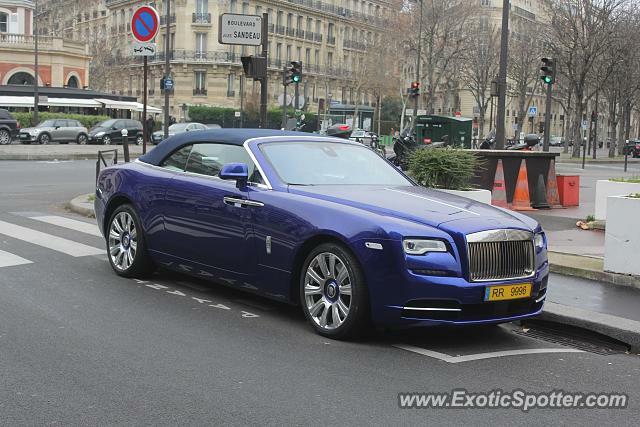 This RR Dawn had a licence plate from Luxembourg. The car was spotted in front of a restaurant called the Flandrin. I have seen many amazing cars valeted there. It is a great place to spot nice cars in Paris. @p3cks Like in England or in the arab countries, you can pay to have a personalized plate in Luxembourg. Of course the "RR" stands for Rolls Royce. The rest of the numbers has probably something to do with 666. Also this is typically a french person that registered his car in Luxembourg to not pay as much taxes as if it was registered in France. Same system as when a car is registered in Montana when the owner lives in Florida. I like the dawn! Nice spec. The font of the licence plate look dodgy to me though..